RLS Flame Panels are extremely versatile and can be used in so many applications in the plastics, glass, printing, and gluing world. Our customers can specify the number of burners, the length of the burners, and what type of controls work best. There are a multitude of options, including standard ignition systems for flame treating lines that are going to have the flames stay on for long periods of time, as well as high power ignition systems for quickly igniting and extinquishing the flame. The high powered ignition systems are key for distances of over 10 feet from the flame panel to the flame head being ignited. These flame panels can be mounted next to or over existing conveyors, mounted to robot heads, mounted to servo and linear guides, or anywhere needed in your application. Compact yet powerful flame panel boxes fit to the side of your conveyor or any other convenient mounting on your line. Flame panels can be controlled via upstream or downstream PLCs, with the ability to ignite and extinguish the flame based on criteria like product present, conveyor running or stopped, line fault, e-stop, and any other input or output required. Our flame panels can come outifitted with a blower that removes the need for plant compressed air that may tax the plant compressor, and saves the time and money of running a compressed air line to the flame panel. 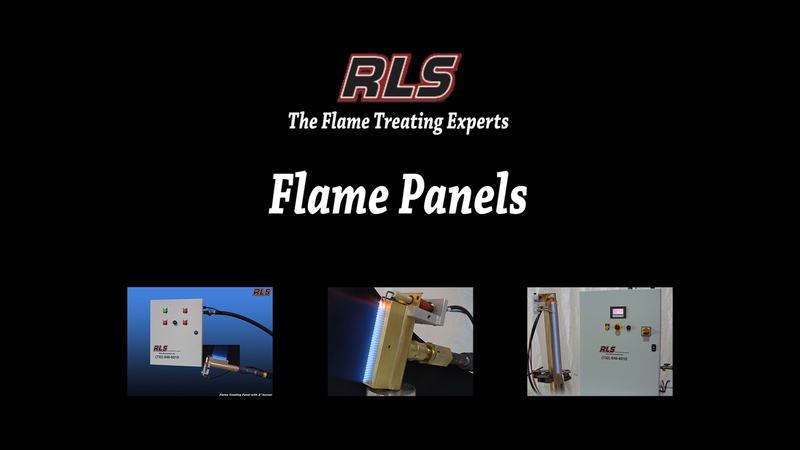 RLS flame panels can run on natural gas or propane, and have the highest safety standard controls in the industry. All flame panels come with RLS enhanced burners that have consistently provided better flame treating results than our competitors burners.